Before we start this week there are a couple of entries for Correction Corner. Firstly, this column would like to apologise to Jodi Dunne, the winning Labour candidate in the Harlow, Bush Fair by-election last Thursday; Councillor Dunne is in fact a man (“Jodi” being short for “Joseph”) and not, as I had incorrectly assumed and wrote in last week’s column, a woman. 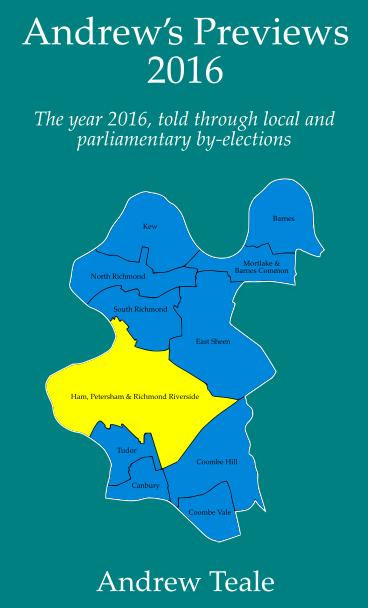 Also, the Dormers Wells by-election last week was not in fact the first by-election in Ealing for ten years; there was a poll in Northfield ward on general election day in 2015 which I had overlooked. Unfortunately this lack of basic research also fed through into my performance in the European Quiz Championships over the weekend in Venice, with my Wales team finishing tenth out of fifteen nations. My apologies for the mistakes; must do better in future. Kent county council; caused by the death of Conservative councillor John Simmonds. A long-serving member of Kent county council, Simmonds had entered politics in 2001 after retiring from a career in banking and finance: he put that experience to good use by serving for eight years as Kent’s cabinet member for finance, only stepping down shortly before his death. He also served for twelve years on the council of the University of Kent, and in the 2014 New Year Honours was appointed MBE for services to local government. He had represented Canterbury North since its creation in 2017, before then sitting for the predecessor division of Canterbury West. For our first by-election we are in a division whose name may be misleading at first sight. This is not the northern division of the ancient Kent city of Canterbury; the city does have a northern county division, but that is called Canterbury City North. The Canterbury North division, by contrast, is almost entirely outside the city and rather diverse. 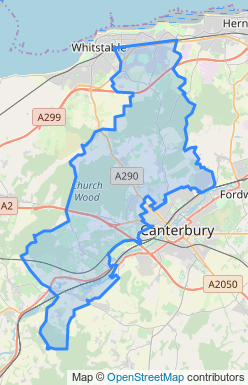 This division is based on three wards of the Canterbury district. At the northern end is Chestfield ward, based on a village of the same name and also including part of the town of Whitstable. To the west of Canterbury lie the villages of Rough Common and Chartham, which are within the Chartham and Stone Street ward and are satellite villages for the city; Chartham is in the Stour valley and has a railway station on the Canterbury-Ashford line. Between them can be found a thickly-wooded area, the Blean Forest ward, within which is the village of Blean on the Canterbury-Whitstable road; this was the home of Smallfilms, the production company which gave us such classics of children’s television as Ivor the Engine, the Clangers and, of course, Bagpuss. But don’t be fooled into thinking that this is a bucolic true-blue ward, even if the 2017 county election result – 55% for the Conservatives, 16% each for Labour and the Lib Dems – might give that impression. Not all the electors here are old enough to remember Bagpuss – indeed, a sizeable number won’t have parents who are old enough to remember Bagpuss. Canterbury North division contains most of the main campus of the University of Kent. One of the plate-glass universities of the 1960s, Kent houses over 6,000 students at its campus on the northern edge of Canterbury. An early Kent student was a young lad called Gavin Esler, who graduated in 1974 with a BA in English and American literature; Esler subsequently worked for forty years as a BBC journalist, and is now the chancellor of the university he once studied at. His predecessor as chancellor was one of the UK’s most eminent psephologists, the opinion pollster and founder of MORI Sir Robert Worcester. The university certainly has a large impact on the electoral roll here. 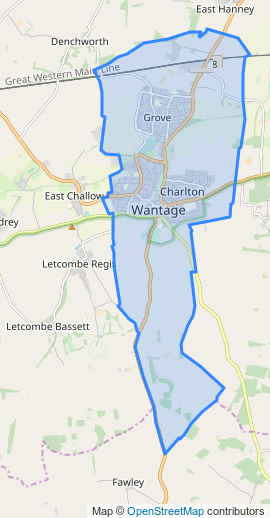 Both county and district ward boundaries have changed here since the 2011 census, but at the time Blean Forest ward (which covers the campus together with Blean) was 70% student, the eighth-highest figure for any ward in England and Wales; in consequence it was in the top fifteen wards in the country for the 18-29 age group and for those educated to A-level but no further. It would appear that the students generally didn’t turn out for the Kent county council election in May 2017, but they must have turned out for the snap general election five weeks later; the Labour gain of the Canterbury constituency, which had returned Conservatives or Independent Conservatives continuously since 1857, was one of the most surprising results of last year. 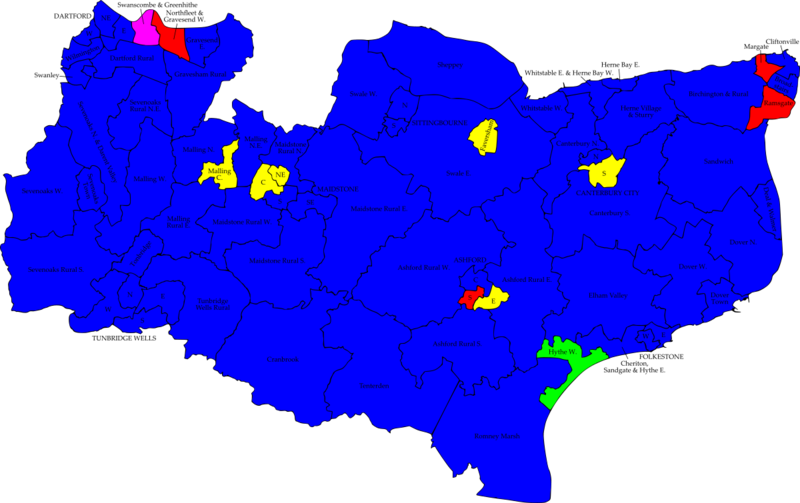 In order for Labour to have won Canterbury last year they would have most likely carried this county division. Suddenly that 55-16 Tory lead in May 2017 doesn’t look all that safe, does it? However, it will be difficult for Labour to repeat that trick for a local election: firstly, there appear to be issues within the local Labour party with talk that their MP Rosie Duffield could be deselected; secondly, the campus electoral roll has turned over twice since the general election and very few of the 2017 students will still be living within the division boundaries. Defending for the Conservatives is a latter-day Thomas of Canterbury: Robert Thomas is an accountant who since 2011 has been a Canterbury city councillor, representing Chartham and Stone Street ward. Labour have reselected Dr Ben Hickman who, as a senior lecturer in poetry at the University of Kent, is somebody with excellent connections to the party’s core electorate in the division. The Lib Dems, who were just one vote behind Hickman at the 2017 county elections, have selected Alex Lister who works in digital communications and is a governor of the local NHS hospital trust: he is campaigning strongly for a new hospital for Canterbury. Also standing are teacher Henry Stanton for the Greens (who was their parliamentary candidate here last year), University of Kent student Joe Simons for UKIP and independent candidate Joe Egerton, who was a Conservative candidate for Canterbury City South in last year’s county elections. Oxfordshire county council; caused by the resignation of Liberal Democrat councillor Zoé Patrick who had served since 2001. She was a former chairman of Oxfordshire County Council, and also served from 2007 to 2011 on Vale of White Horse district council. From the modernity of the University of Kent we travel west and back in time, to the ancient town of Wantage. The birthplace of Alfred the Great, Wantage was a Berkshire town until 1974 and benefited from its location, at the foot of the Berkshire Downs within the Vale of White Horse. The Ridgway, by some metrics England’s oldest road, ran along the escarpment above the town; however, the Industrial Revolution rather passed Wantage by, and it is poorly served by rail and road. It took until the Second World War for major development to come, with the RAF opening Grove Airfield to the north of the town in 1942. The airfield subsequently became a USAAF base before passing into the hands of the UK Atomic Energy Authority, which ran a laboratory here for a time and built a large housing estate to provide accommodation for its employees. That turned Grove into a very large village, although it is still just about separate from Wantage. Since 2005 Grove and Wantage have jointly elected two Oxfordshire county councillors. Throughout that period both of them have been Liberal Democrats, although the Conservatives have always been close behind – particularly so in 2005 and a 2008 by-election. The 2017 result had an eight-point lead for the Lib Dems which represented very little change from four years previously: the winning Lib Dem slate polled 43% to 35% for the Conservatives and 13% for Labour. Mind, there is something strange going on with the Labour result as recorded here in 2017, which had 745 votes for their regular candidate Jean Nunn-Price and just 127 for her running-mate George Etherington despite his being top of the ballot paper. One wonders whether something has gone wrong there. The Conservatives performed better in the last Vale of White Horse district council election in 2015, winning five of the division’s six district council seats to the Lib Dems’ one. There is extra impetus for the Tories here: they presently hold 30 of Oxfordshire county council’s 63 seats, and this is the first of two county council seats the Lib Dems are defending in by-elections this month. If the Tories can gain this seat and the Wheatley by-election in two weeks’ time, they will have an overall majority on the county council. Defending for the Lib Dems is Jane Hanna, a qualified barrister who was the first female Fellow of Keble College, Oxford and taught at Oxford University for twenty years. Hanna is the founding chief executive of a charity providing advice and bereavement support to families of those who fall victim to Sudden Unexpected Death of Epilepsy, and in 2010 was appointed OBE for her contribution to health services. She was a Vale of White Horse councillor from 2003 to 2013, representing Marcham and Shippon ward. The Tories have selected Ben Mabbett, a district councillor for Grove North ward within the division and Wantage town councillor. The Labour candidate is Dave Gernon, an Oxford University IT professional who also does computer repairs. Completing the ballot paper is Kevin Harris for the Green Party. Stroud council, Gloucestershire; caused by the resignation of Labour councillor Alison Hayward, who has moved away from the district. She had served since 2016. Henry BOLINGBROKE: How far is it, my lord, to Berkeley now? -William Shakespeare, Richard II, II, iii. Act II, scene III of Shakespeare’s Richard II is set in the “Wilds in Gloucestershire” which is a fair description of the setting of Dursley. Shakespeare may have known it well: there is a local tradition that he spent some years in Dursley working as a schoolteacher. The Berkeley which Bolingbroke and Northumberland were travelling to was Berkeley Castle on the banks of the Severn, where some decades earlier Richard II’s great-grandfather Edward II had met his end, most likely through foul play although the bit about the red-hot poker is probably apocryphal; but Dursley had a castle as well, built in 1153 during the last days of the Anarchy by Roger de Berkeley. The location was good, guarding a valley in the Cotswold hills; and it’s the proximity of the Cotswolds which is proving a boon to the estate agents of southern Gloucestershire. The scenery is certainly nice by all accounts; but despite its setting Dursley was a surprisingly industrial town. That was mainly thanks to R A Lister and Company, whose engine factory was based here and which until quite recently employed many of the local residents. Inevitably, most of the factory site is now houses. Lister’s brought to Dursley the Danish inventor Mikael Pedersen, who invented his eponymous bicycle here; Pedersen bikes are still in production, although they’re not made in Dursley any longer. The exit of most of Dursley’s industry, despite the best efforts of Labour-led Stroud council which is apparently keen to keep some heavy industry going here, has left a post-industrial town which is slightly too far away from the M5 motorway to be attractive to commuters to Gloucester and Bristol. Stroud council elected by thirds until 2016 when it moved onto the whole council elections cycle, but unusually Stroud holds its whole council elections in leap years (the only other councils with that electoral arrangement are Gloucester and Warrington). Dursley ward has unchanged boundaries since the modern Stroud council held its first election in 1973. Despite its industrial recent past it has been for most of its existence a closely-fought three-way marginal ward, although since the Coalition was formed Labour have risen somewhat at the expense of the Liberal Democrats. Since 2014 Labour have held all the ward’s councillors; at the most recent election in 2016 the Labour slate led here with 37% to 25% for the Conservatives and 24% for the single Lib Dem candidate. The Dursley division of Gloucestershire county council has some more genuine Cotswold rural territory making it more Conservative-inclined, and the Tories gained it from Labour in the 2017 county elections. Nonetheless, Labour did bounce back from that to gain the Stroud constituency at the snap general election five weeks later. Defending for Labour is Trevor Hall, a retired trade union official who had been a shop steward at the Lister’s factory. Living on the same road as Hall is the Conservative candidate Loraine Patrick, who has been a Stroud councillor for this ward twice before (2002-03 and 2007-11), was runner-up here in 2016 and since 2017 has been the town’s county councillor. The Lib Dems have selected Richard Blackwell-Whitehead who is an engineer working with lasers. Completing the ballot paper is Stroud resident Yvon Dignon, representing the Green Party. My thanks to local Labour and Liberal Democrat campaigners for their help with this preview. Bassetlaw council, Nottinghamshire; caused by the disqualification of Alan Chambers, who failed to attend any meetings of the council in six months. Twice Mayor of Retford, Chambers had served since 2012; he was elected for Labour but had been sitting as an independent councillor since May 2017. We finish the week in a town within the debatable lands where the Midlands end and the North begins. It’s certainly been fought over for a long time: the Venerable Bede, in his Ecclesiastical History of the English People, described the AD 617 Battle of the River Idle in which Raedwald, king of East Anglia, defeated and killed Aethelfrith, king of Northumbria. According to local legend, the Idle ran red with blood afterwards giving a name to a local crossing point: the red ford, or Retford. A nice folk story there, but it doesn’t quite stack up: although the name Retford clearly relates to a ford on the River Idle, there’s all sorts of debate among toponymists as to the actual meaning of the name. It’s certainly a town whose name can be rather confusing even now. Bill Bryson, in his Notes from a Small Island, which less than 25 years after its publication is now worryingly dated, visited Retford and noted that the place was so obscure that it didn’t feature in the AA Book of British Towns. Let the record state that Retford is in that book, but it appears there under the name of East Retford which is still the town’s official name. The compass point comes from the fact that the town was originally founded on the western side of the ford (“West Retford”), but the eastern side (“East Retford”) eventually became more important and developed into the town centre with lots of nice Georgian buildings. 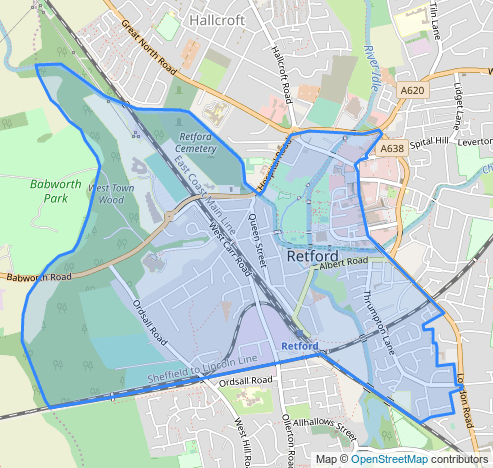 (East) Retford is in fact another old town, having been given a borough charter by Henry I in 1105; that status gave the town independence from the sheriffs of Nottingham, and Retford still guards that independence today by generally looking north, over the Yorkshire boundary. 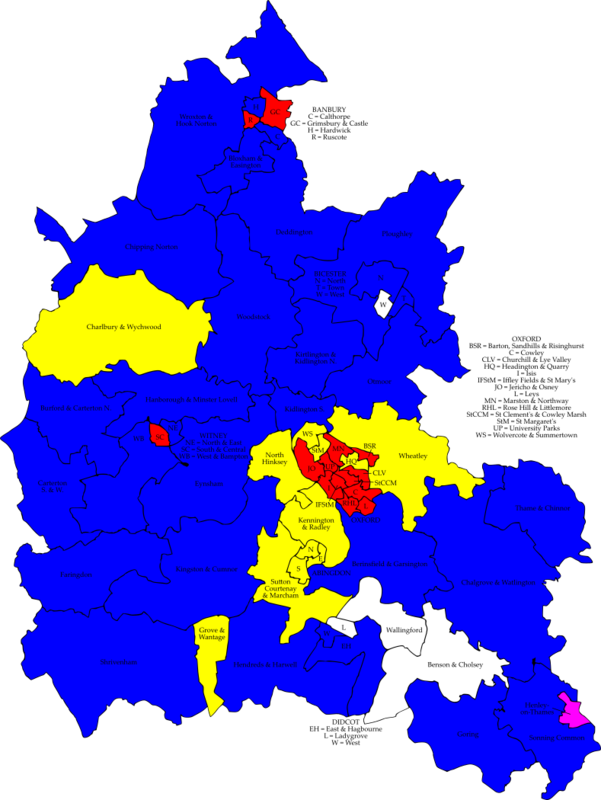 Bassetlaw council is associated with the Sheffield City Region, although it doesn’t (yet) get a vote for the city region’s mayor; and Retford is the only Nottinghamshire town to have Doncaster (DN) postcodes. Today it remains a rural market town with some passing trade: the Great North Road once ran through the town, and the East Coast Main Line and Sheffield-Lincoln railway lines still stop here. The railway station is at the heart of the East Retford West ward, which is based on the old West Retford but also extends over the Idle to take in part of the town centre. In the seventeenth and early eighteenth centuries East Retford was a notorious rotten borough, generally held to be in the pocket of the Duke of Newcastle. 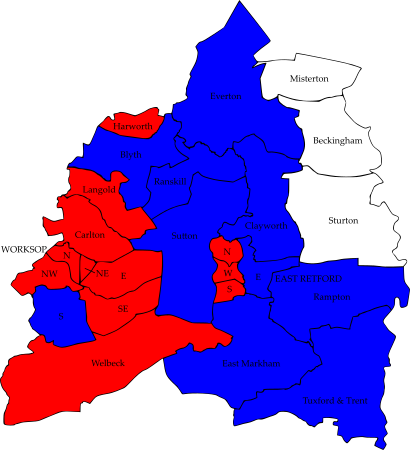 An attempt was made in 1830, before the Great Reform Act, to disenfranchise Retford for corruption; that was eventually fended off by extending the boundaries of the East Retford constituency to take in the whole of the Wapentake of Bassetlaw, including the town of Worksop. 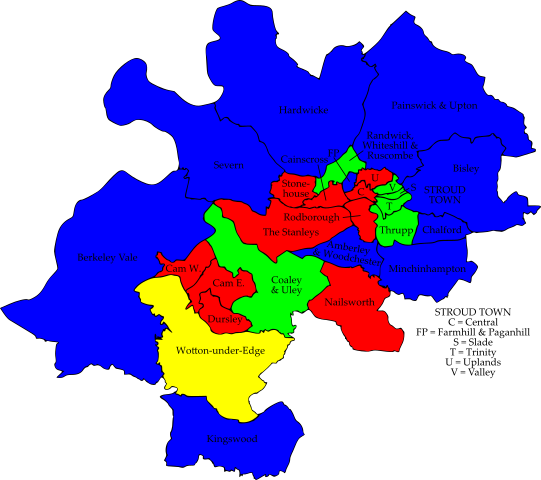 With some boundary tweaks and a name change to Bassetlaw, the constituency has been roughly the same ever since. Since 2001 it has returned to Parliament the Labour MP John Mann, whose politics may not be to the taste of everyone within the Labour movement but are clearly a good fit for the area. As with much of the Midlands Bassetlaw is swinging towards the right at parliamentary level; in June 2017 Mann’s lead was down to 9.3 percentage points. However, but that hasn’t yet been reflected on Bassetlaw council which returned a large Labour majority at its last election in 2015. Poor organisation from the Conservatives will have helped in that: although the Tories topped the poll in East Retford West in every election from 2002 to 2008, there was only one Conservative candidate here for the ward’s two seats in the 2015 election. In that poll Labour held both of those seats with 37%, to 29% for the Conservative candidate and 21% for UKIP. The Tories did gain the local county division of Retford West from Labour in May 2017¸ but only by 54 votes; it seems clear that favourable boundary changes, which brought the rural and Conservative-inclined Sutton ward into the division, made the difference there. Defending for Labour is local resident Matthew Callingham. The Conservatives will be hoping to show they have the momentum in what is now a marginal parliamentary seat: they have selected Emma Auckland, who works in a local supermarket having previously run her own business. Completing the ballot paper is Helen Tamblyn-Saville of the Liberal Democrats.